The well-known naturalist Edward O. Wilson (author of Naturalist, The Diversity of Life, and many other books) gave a talk for TED Conferences LLC in 2007. 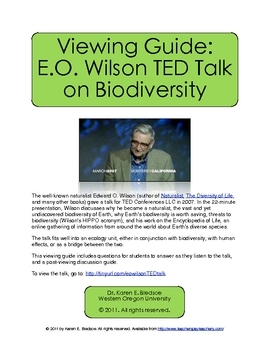 In the 22-minute presentation (link included in this resource), Wilson discusses why he became a naturalist, the vast and yet undiscovered biodiversity of Earth, why EarthÊ¼s biodiversity is worth saving, threats to biodiversity (WilsonÊ¼s HIPPO acronym), and his work on the Encyclopedia of Life, an online gathering of information from around the world about EarthÊ¼s diverse species. The talk fits well into an ecology unit, either in conjunction with biodiversity, with human effects, or as a bridge between the two. This viewing guide includes questions for students to answer as they listen to the talk, and a post-viewing discussion guide. Answer key is included.